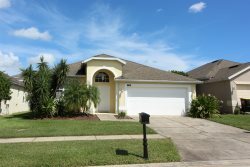 this vacation home is nestled in the popular Indian Creek community, less than 2.5 miles from Disney's doorstep in Kissimmee, Florida and is perfectly placed for the shops, restaurants, fun and attractions that Orlando has to offer. 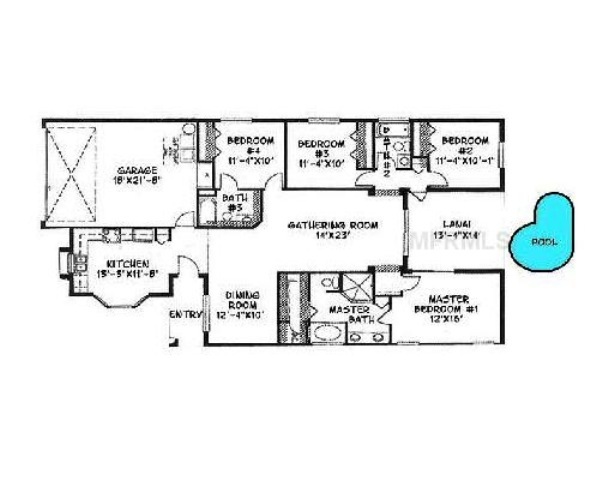 With 4 bedrooms and 3 bathrooms, this fully air-conditioned, family friendly vacation home is perfect for extended families, friends traveling together or for those that just need a little extra room, sleeping up to 10 people (even more if there are babies!). 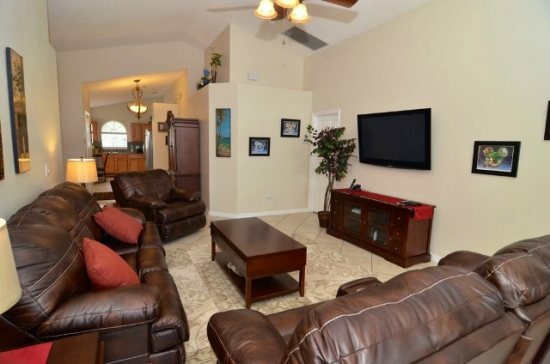 It has a spacious vaulted family room to relax in during the day or evening, with a luxurious leather sofa, loveseat and chair, cable TV, VCR, stereo and DVD player to enjoy your favorite movie or listen to your favorite music. There is even more fun and entertainment in the private games room. With a pool table, and air hockey you won't want to leave! Step out from the family room under the shaded lanai, and sit and eat al-fresco on the cushioned recliners, watching the sun rise as you enjoy your breakfast. Step on to the huge sun-baked screen enclosed pool deck, and dip in to the cooling and sparkling waters of your own private pool! When you want to really soak in the sunshine, laze out on one of the sun-loungers and take in all that Florida sunshine. When you are done in the pool, additional doors off the deck lead directly to the master ensuites. For extra added protection for young children should you need it, all doors leading on to the deck area have been provided with additional safety locks and switchable alarms. Your home is furnished with all that you need for children, with a stroller, pack n play crib, high chair. The kitchen has been equipped with everything that you could need to provide a family feast to enjoy together either at the dining area off the main family room, or at the breakfast nook or out by the pool. Luxurious sleeping accommodation awaits you when you stay at Mickey's Magical Vacation home. with 1 King Beds, 2 Queen Beds, and a single over double bunk bed. Excellent working with you and your wife, and of course Angela who was so patient with me. There was a little confusion at first, in that Formosa property manages the upkeep and not you. The operating manuel was a little confusing. Overall, we really enjoyed our 5 week stay. Our dealings with you were great and as we are not sure at the moment about our plans or needs for winter 2015, we hope to be in contact with you again when we firm up. We may not need such a large house next time, and I checked your site last night and noticed that there are condos available. We will certainly be in touch. Thank you for your assistance. Eric Curtis.